Spending a boatload of time on YouTube is a pitfall that many of us have succumbed to at one time or another. They've made it so easy by linking to related videos at the end of each video and having a permanent sidebar of interesting/sponsored content within sight. For some, dogging the pages of YouTube has become a habit, maybe enough to be called a hobby. Whittling away daylight by staring into ever-enlarging maw of YouTube content can give you vertigo. Here's how you can take that dedication to the next level, Hero. 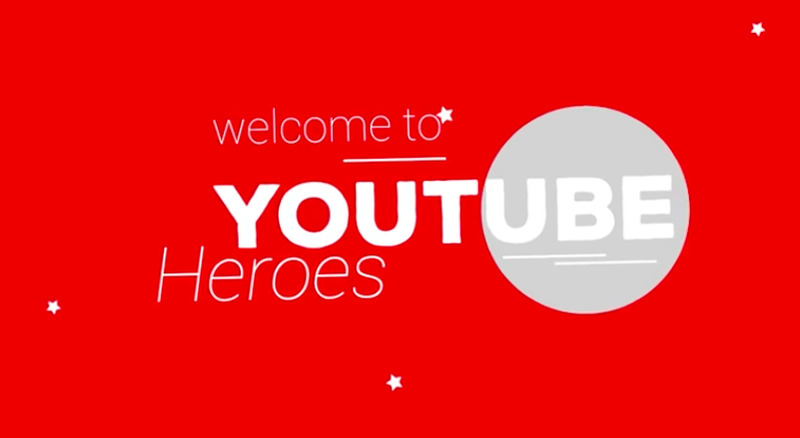 YouTube Heroes (#YTHeroes), launched on Tuesday, is a kind of rewards system. Where there is inappropriate content to be flagged, a hero is born. Where captions and subtitles are lacking, a hero is born. Where forums are lacking in knowledge ... well, you get it. Basically, you contribute to the larger YouTube community by correcting things, adding what is missing, or patrolling for things that should not be seen by a civilized human. In doing so, you "help create the best possible YouTube experience network for everyone." Each contribution garners a certain number of points which unlock perks; as it goes, top contributes get "top Hero perks." These rewards include sneak previews of new products, access to new features in the testing phase, and exclusive workshops. There are several Hero levels to progress through, 1 to 5, with level-ups based on a points system ranging from 0-1,000 points. Examine the madness for yourself here. Those who really throw themselves into the work, Level 5 Heroes, will be able to apply to attend the "Heroes Summit" where, based on the above video, a group of the most dedicated YouTube Heroes will gather for YouTube-themed festivities. The position is open to anyone with a YouTube account, apply here if you're interested. If chosen (I doubt there's any selection process, probably just verifying information and such) Heroes are given a personalized dashboard to track their history of heroism and keep tabs on upcoming rewards. I commend YouTube for their creativity in encouraging community support, but this seems like a way to pass off work. Granted, YouTube is a massive, swirling vortex of endless videos that continues to have content hurled into it at all times, so I'm sure it can be tricky to get a handle on things. They've taken advantage of their mass appeal by allowing their loyal users to have a part in the mania.